We were driving home the other night and were treated to a spectacular display of color from an oncoming thunderstorm. I can remember when weather like this would have elicited a sigh or even a grumble because it would have meant an extra hour of commute time and the possibility of accidents. Living in the country as self-employed small business owners has altered our perceptions. We welcome rain as a much needed blessing. Even the fall of snow is welcome as it keeps the ecosystem in balance. Our lives and activities are more closely linked with others than ever before, but the rhythm is different than in years past. We set the times of our comings and goings to make the best use of our time and the times that others can meet with us. The rigid tyranny of the time clock or the weekly schedule are a distant memory except when we get swept up in some project and find ourselves repeating yesterdays mistakes. We actually spend more time being productive than ever before although we can spend more time socializing than we did in past years. It is the flexibility of our schedules that makes the difference. It is not uncommon for me to work for many hours after dinner on some problem that is refusing to bend to my will. I find the challenge of solving a design problem far more absorbing than the hyped up excitement of a TV thriller. 24 and the other dramas are only fascinating until one sees the standard patterns emerging. Life as a designer is continually fascinating as there is an infinite array of problems to solve. So, back to the weather. 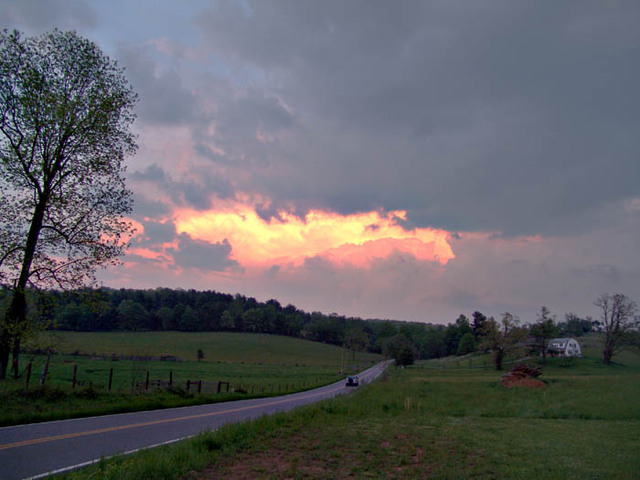 We stopped the car and shot photos in the waning light, then we drove further and shot some more as the clouds opened to reveal a flaming heart to the thunderclouds overhead. We luxuriated in the rush of cool air that preceded the storm and we gratefully accepted the small spattering of raindrops that followed. No storm for us, just a small reminder that there is beauty in everything if we take time to find it. This entry was posted in Country Living and tagged business owner, commuting, life as a designer, productivity, self-employed, small business owner, thunderstorm, time clock, weekly schedule. Bookmark the permalink.